FFA - Michigan Governor Rick Snyder tells Hamas linked Islamic Society of North America (ISNA) conference attendees that Israel has a right to peacefully exist after he received thousands of emails and phone calls protesting his appearance. 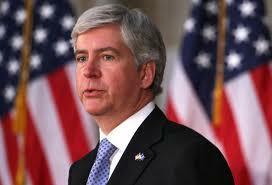 Florida Family Association sent out email alerts that reported “Michigan Governor Rick Snyder to speak at The Islamic Society of North America (ISNA) conference on August 29th.” The alert encouraged readers to send emails that educated Governor Snyder about ISNA and urged him to withdraw from addressing the Hamas linked organization. Thousands of people sent emails and called the governor’s office. Nevertheless, Governor Snyder addressed the ISNA conference. During his address the Governor defended the right of Israel to peacefully exist. The Governor’s defense of Israel did not go unnoticed by Islamists. Hatem Bazian skewered Governor Snyder in a Facebook post. “You lost the Muslim-Arab vote in Michigan! While the Governor is welcome to his point of view but to come to a Muslim convention and attempt to score points by pushing AIPAC's agenda is insulting and demonstrate a lack of basic political respect to the community.” The full Facebook post is provided at the end of this article. Hatem Bazian is a professor of Islamophobia at the University of California, Berkley. The Clarion Project reports "'Moderate Islamists' Turn on MI Gov. for pro-Israel Comment." Florida Family Association applauds Governor Snyder for defending Israel to this Islamist group. In fact, the governor may have been inspired to make such statements after being criticized by thousands of Florida Family Association supporters and other concerned Americans from across the United States. However, Governor Snyder should not have legitimized Hamas linked ISNA with his presence by addressing the conference in the first place. Call Michigan Governor Rick Snyder and express that Palestinians have the right to exist, be free on their land and an immediate end to Israeli Occupation. You lost the Muslim-Arab vote in Michigan! Michigan Governor Rick Snyder spoke at the opening session of ISNA's 51st Annual Convention on Friday held in Detroit and made it a point to declare that Israel has the right to exist without making any references to the Palestinians. The statement was completely out of context and seems intended to make a point to his audience as if to each them a lesson considering the recent situation in Gaza. Being in America, one understands the political leadership taking its marching orders from AIPAC and repeating the same exact words every opportunity they have as if it is part of the US constitution. While the Governor is welcome to his point of view but to come to a Muslim convention and attempt to score points by pushing AIPAC's agenda is insulting and demonstrate a lack of basic political respect to the community. What is more glaring is that no one on the stage jumped to make any comments after him to indicate that the implied insult conveyed by the Governor in this speech is not acceptable to the Muslim community and for it to be expressed at this time considering the slaughter campaign unleashed by Israel on Gaza. Governor Snyder's comments come on the heels of similar comments by President Obama during the Ramadan iftar when he stated that "Israel has the right to defend itself" to the gathered Muslim audience as if to make a point and to teach a lesson to the gathered group while bombs are raining on Palestinians in Gaza. Once again, the President and Governor are expressing these statement in a purely political context to demonstrate and their unwavering support to Israel even when they are speaking to a Muslim audience. What this demonstrate is that the venue is Muslim and the attendees are Muslim but the audience for the speech is AIPAC, pro-Israel supporters and the anti-Muslim segments of the American society. Muslims are present in body but not included in the discourse or more critically are insulted to demonstrate a commitment to Israel at our expense, US citizens and tax payers. Next time someone stands and speaks in a microphone provided and paid for by Muslims the basic demand should be that they respect the political, social and religious sensibilities of the community. Furthermore, Muslims organizing such gatherings should not be only happy for having one of our paid public servants address our community; rather we should be a dignified people and would have expected a woman or man in the organizing committee to have the courage to stand up and correct this insult taking place in the middle of our own momentary convention home. We had no control in the White House but this was our stage, microphone, people and invited guest but no one responded and no one took spoke and all the Muslims become voiceless and erased from their own constructed play. We are not increased in status by the visit itself and for sure after such an insulting behavior. Your strength is your vote, organizing and donations to run your own campaigns. In a state like Michigan with such a large Arab and Muslim population, the Governor's insult and complete disregard of our community only points to the low standing and regard the community has in the eyes of these AIPAC paid-for type politicians. We can change this by making sure that we double our efforts and make those who hold public office respect the community and its political views and for sure Governor Rick has lost our vote and if he runs for President then count on me to call and organize Muslims across the country to oppose his candidacy.